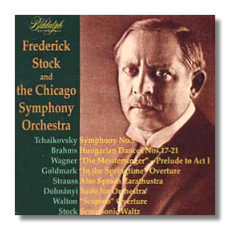 For thirty-seven seasons, from 1905 until his death in 1942, German-born conductor Frederick Stock served as music director of the Chicago Symphony. During those years, this adventurous conductor explored virtually every aspect of the orchestral repertory - from Bach to contemporary composers like Walton, Holst, Kodály, and Prokofieff. His recorded repertory was almost equally broad, though all too few examples of his work are available in compact disc format. This excellent collection thus helps fill a serious gap in the catalog. The selections presented here date back to the dawn of the electrical recording era (Goldmark, 1925) and carry us through nearly to the end of the conductor's life (Paganini and Walton, 1941). These two generously filled discs serve not only as an excellent sampler of Stock's work, but they also tell us much about the early history of the Chicago Symphony. The evolution of the orchestra is clearly audible - from the scrappy, but determined band that could barely keep together as its conductor raced through five of Brahms' most familiar Hungarian Dances to the highly polished ensemble that effortlessly executed the tricky rhythms of William Walton's brand new Scapino Overture. At the same time, we may also observe Stock's growth as an interpreter, drastic changes in the style of orchestral playing, and amazing improvements in the art of recording. While I really must give Stock's Tchaikovsky Fifth points for its sheer wackiness, the conductor's unfortunate habit of slowing down at critical junctures in the score badly impedes the flow of the music and deprives it of energy just when it is needed most. From time to time he also speeds up abruptly, and the pace occasionally becomes so frenetic that his string players simply can't articulate all the notes. If you enjoy the similar fits and starts of Mengelberg's classic recording of this symphony (and I most certainly do *not*), you may like this version as well. It's obvious that even in the mid-1920s (when this recording was made) that the Chicago Symphony's brass section was one of the best anywhere. However,this ensemble was not yet a great orchestra. Stock clearly had his work cut out for him over the next several seasons. By the time Richard Strauss's Also sprach Zarathustra was recorded in the winter of 1940, Stock had radically transformed the Chicago Symphony into an instrument that was poised to take its place as one of the world's finest. While his interpretation of the this work is not quite the equal of the probing accounts of Koussevitzky or Reiner, Stock's version is surely among of the most highly charged and well constructed recordings of this enigmatic score. The great, lumbering beginning of the "Science" fugue is particularly memorable. The "Dance-Song" trips along in an enchanting manner despite a schmaltzy violin soloist who seems to belong more to the previous century than our own, and the concluding "Song of the Night-Wanderer" brings the work to a lovely, tender, and ultimately haunting conclusion. The dynamic range of this recording is surprisingly wide for its era, even though the sound is otherwise muffled and the surfaces of the original 78s are quite noisy. It's too bad Stock didn't record more Strauss during this period. I'd love to hear his Quixote or Heldenleben with this magnificent orchestra. With the sole exception of Stock's own rather insipid waltz, the remaining selections are all sparkling gems. Stock was clearly inspired by such miniatures as the Glazunov, Suk, and his own inventive transcription of the Paganini. His recordings of these pieces have a quicksilver brilliance that rivals the work of that great Russian/English conductor of the time, Albert Coates. Only one piece in this collection demonstrates Stock's passion for and fascination with new music - Walton's Scapino. This spirited and idiomatic rendition is the only recording of the composer's original version. Mark Obert-Thorn, long known for his outstanding work in sound restoration, prepared these excellent transfers. He has somehow managed to make all of this disparate material listenable - even Columbia's very poorly recorded Zarathustra. No one interested in the history of classical music on records should pass this intriguing collection by.